Artspost in Hamilton will be hosting an exhibition of works by Anthony Davies. 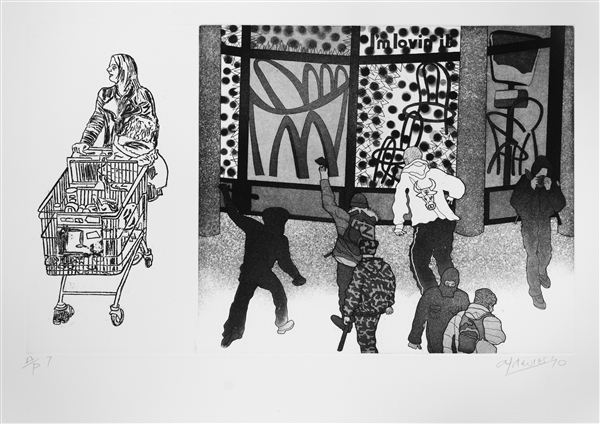 Closing The Gap is a series of 15 prints, etching and aquatint. and will be on display from 23 March to 29 April. An opening preview will be held on 22 March at 5.30pm. ‘Closing the Gap’ investigates recent socio-political events in Aotearoa New Zealand. seeking to dene its cultural identity, and at the mercy of consumer culture? Davies says, “I want people to think about how other people live, how they exist. People should be aware of what’s going on in the world”. of classical intaglio printmaking: etching, aquatint, dry point and sugar lift.